I must confess the fake tan reappears nearing New Years Eve. Of course I cannot have patchy tan so I desperately need to scrub and moisturize in order to prep my skin for fake tan application. I find that this Champneys body glow scrub works a treat apart from smelling amazing. It contains Bora Bora sand! So obviously this is a must have in my beauty essential kit. I also like to do a face mask at least a week before so if it does break me out, my skin has time to settle down before the big event! Follow this rule. Having pimples is irritating anyway, especially when there will be copious photos reminding you, you should have prepped your skin before! Now, I am normally of a mud mask girl, especially masks from REN. However, I used to get these masks with my sisters when we were little and I thought I would give it a try again. 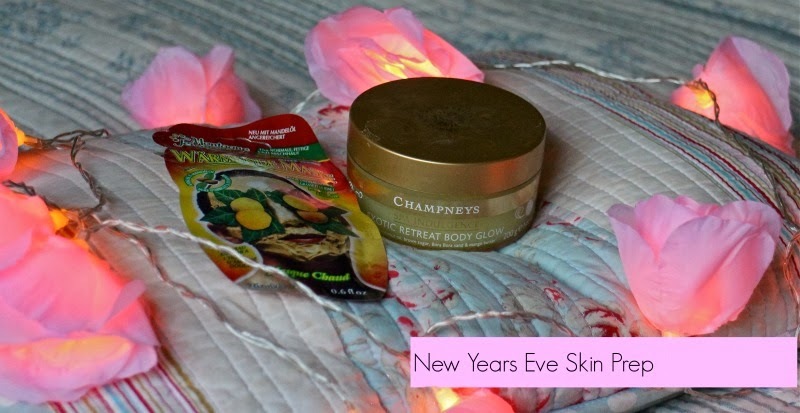 It made my skin very soft and smooth and thus why it is now being included into my New Years Eve beauty kit. I would love to know what is in your beauty kit and how you will be preparing for New Years Eve, let me know in the comments below.